Do you need a device that will enable you to charge all of your devices at once? ON smart solution electrical outlet bar has been constructed for your absolute ease- 3 outlets and 2 USB ports are included! Now you spend hours in your office without having a single care in this world- as you will be able to charge all of your laptops, tablets or mobile phones while having a fan, a heater or a table lamp nearby! 2 USB ports feature 2.4 A max output for fast and efficient charging- what else do you need? If you are looking for a power bar that will last for ages without getting damaged, then this product is going to blow your minds off! 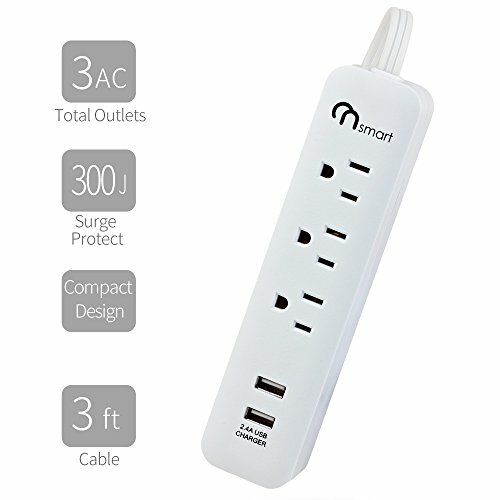 Our power strip features a built-in 300 Joules surge protection for outstanding results- say goodbye to undesirable over-voltage that can damage your devices' function! What is more, IC multi-protection saves you from short-circuit, over-current and over-heating problems! Now you can get a stylish power strip that you'll keep for a lifetime- isn't it great? Portable SURGE Protect CHARGING Station: ETL listed surge protection charging station. 3 AC outlets with 2 USB ports provide all you need for your power hungry devices at home, at dormitory, at office, or in travel. 300 Joules surge protection provides basic surge protection to your devices. You can use it without any worry. What else do you need? 2.4A TOTAL USB POWER OUTPUT: 2 USB that deliver 2.4A total output that is more than enough to charge up 2 phones at the same time or even two tablets in some cases. This can simply free up 2 of your big charger and keep things nice and clean. Reducing your loading in travel. Make you one less things to worry when packing up for vacation. COMPACT and STURDY: Compact but high quality. Small but well build. The ultimate ergonomic design in perfect balance of size and functionality. Not an inch more or less. Save space for you home, dormitory, and office. Providing the safest power delivery solution to you. POWER on the GO: the size and the cable is specifically design to save space for your luggage. Take this to vacation without adding extra loading to you. If you have any questions about this product by ON Smart Solution, contact us by completing and submitting the form below. If you are looking for a specif part number, please include it with your message.